← How Much Does a Wedding Cost? 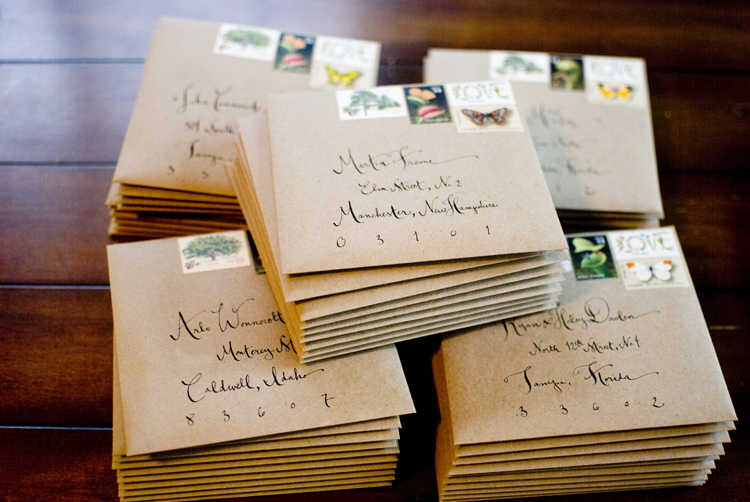 O humble wedding invitation, how can thou cause such stress? That is the question that Jane and I have been asking as we finalise our wedding invitations. The need and idea for a wedding invitation is simple enough: we are getting married, we would like family and friends to join us and we need to let them know the details. So in comes the all important wedding invitation, but this step has been far from a simple one. Naturally our preference would be to send out something that we both like and this has been a task in and of itself. All the way along the planning process, my standard has been a royal wedding minus the royals so when it came to invitations I envisaged a classical fine square of crisp white card with the text pressed through the card and traced over in gold. I soon realised that the reason such a design is used at royal functions is because it requires a royal budget. Prices for embossed and letter press finish invitations can easily come out at around $5 or $6 per invite and especially when we are creating invitations for both the reception and the afternoon tea we had to be mindful of costs. So we began to look (and look and look and look) for a style and materials that appealed to both of us. Jane, to her great credit, spent quite a bit of time out with her mother buying samples of papers that could be used. I think for Jane it got to such a point of looking that she began to hate invitations all together and thought the idea of sending out a group email instead was rather tempting. However, we eventually did find a design that we were both happy with. It was economical, looked elegant and also picked up on the general colours we had chosen for the day. Once we had made this decision, Jane’s mum went back to the store to purchase enough paper for all the invitations and then sliced it all up into the required sizes (thanks Clare). However, we then made a disappointing discovery. We noticed that the patterned paper we had just bought and sliced must have been a different dye-lot to the original sample! It was a subtle difference but it was significant enough to leave us feeling somewhat dissatisfied. Now of course compared to poverty in the third world our little problem did not rate highly but we had spent a lot of time matching up the papers so this little dilemma added some stress which was certainly not ‘invited’. We considered our options: basically we could settle with what we had already bought or we could go back to square one and try to find a paper with a different pattern which would still work with our other colours. We spent some extra time searching for alternatives and also sought the opinion of a few friends, but finally made the choice to stick with the original paper. Meanwhile there was the massive task of collating the names and addresses of all the guests into a database so we could get the printing process underway. Luckily, most of our friends and family were very prompt in replying to emails, Facebook and text messages (I am still waiting for a couple of responses) – and the trusty old family address book came in pretty handy too. But alas, along came the next slight hiccup. The textured card that we had chosen to print the invitation details on didn’t seem to agree with the printers available to us. After a little more frustration and stress, we eventually managed to find one that didn’t have issues with paper jams or ink smudges. We immediately printed and sliced the invites before the copier could change its mind on us! And of course I haven’t even mentioned the long conversations we had around the wording of the invitations and the choice of font but that would take another whole column! Let us just say that every aspect of the wedding invitations carry a story. We are still in the process of gluing and trimming but this seems to be under control with a type of assembly line that has been set up by a very experienced mother-of-the-bride and some extra volunteers to assist. Jane remains a bit on edge about the whole operation and is waiting for that seemingly elusive day when the invitations will officially be signed, sealed and delivered! Posted in Uncategorized and tagged engagement, handmade wedding invitations, marriage, proposal, wedding, wedding invitations, wedding stationary. Bookmark the permalink. I doubt there is any one who does not have issues over the invitations – it’s just normal but that does not help the stresses.